Dodge is continuing its tradition of offering the most revolutionary vehicles on the road. The SRT Hellcat made its introduction two years ago, and it quickly became one of the most highly coveted engines on the market, available in the Challenger and Charger models. Now, Dodge is ramping up to release their 2018 Dodge Challenger SRT Demon. The vehicle will be released at the New York International Auto Show. 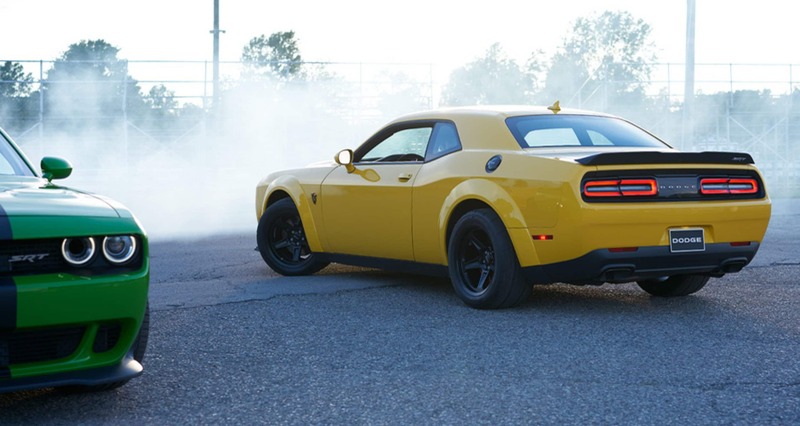 Tim Kuniskis, who serves as the Head of Passenger Car Brands for Chrysler, Dodge, SRT, and FIAT - FCA North America, spoke to the Dodge brand's unrelenting devotion to power as evidenced in the Dodge Challenger SRT Demon. Said Kuniskis, "Most cars attempt to be everything to everybody. Then there are the rare few that revel in a single objective, rendering them totally irresistible to a subculture." The Dodge Challenger SRT Demon belongs to a subculture of driving enthusiasts who prioritize power, muscle-car power, and reputation. The Challenger SRT Demon will be revealed at the New York International Auto Show, but in anticipation of its release, Dodge will be releasing teaser videos that display the SRT Demon's extraordinary powers. The videos will contain clues as to the next chapter in the story of the SRT Demon, with Dodge adding further details regarding new engineering that went into the development of the vehicle. Dodge fans will definitely want to check out the www.ifyouknowyouknow.com website. This website contains a clock that counts down to the release of the next video, and it will continue going until the Dodge Challenger SRT Demon is revealed at the New York International Auto Show. Dodge will be using the hashtag #DodgeDemon on social media platforms, including Twitter, Instagram, and Facebook, and Dodge enthusiasts are encouraged to utilize the hashtag as well. Snap-on Business Solutions will be collaborating with Dodge, making available a variety of features that will make it easy to create a street-to-track experience with the Challenger SRT Demon. These optional accessories will feature Demon logos, and the options will include a tool bag, fender cover, hydraulic floor jack, torque wrench, cordless impact wrench with charger, and tire pressure gauge. These tools will all come crated alongside a dozen additional parts, including a Demon Track Pack System and Direct Connection Performance Parts. The Dodge brand has long been then go-to for customers who want a classic American coupe or sedan, a powerful truck, or a sporty yet refined SUV. Dodge has been able to integrate every one of their vehicles with driver-oriented features, and along with the engineering from SRT, the brands have worked to create the most innovative performance features on the market. Dodge vehicles are known for their eye-catching design, along with hallmark features including signature racetrack tail lamps, 8.4-inch touchscreen Uconnect infotainment centers, and cold-air induction. The Demon name made its debut on the iconic third-generation Dart, starting with the 1971 Dart Demon. We cannot wait for the 2018 Dodge Challenger SRT Demon, and we bet you can't either! You can look forward to the SRT Demon making its debut on April 11th, just ahead of the New York International Auto Show. If you want to learn more about the Dodge or SRT brands, contact us today at East Hills Chrysler Jeep Dodge Ram!